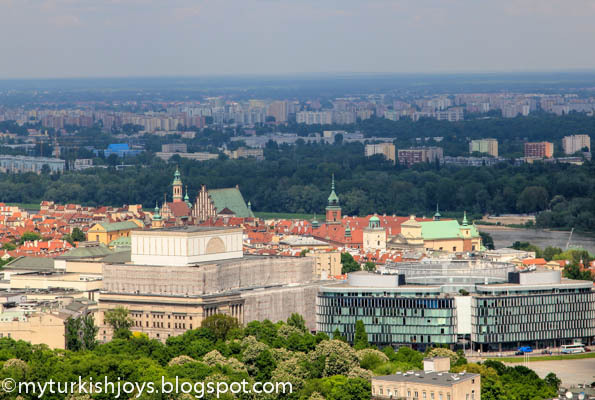 In My Love Letter to Istanbul post, I announced that we have moved our expat life to a new location – Warsaw, Poland. This move had been in the works for a few months, and I’ve been trying to figure out how to best adapt and make some changes to the blog. Since we are no longer living in Turkey and we may be on the road for awhile, I decided to change the name to My Traveling Joys. I think this name serves as a good blanket for what I write about here – travel, food, living as an expat and my every day adventures. In my new city, I’ve slowly been discovering new “joys” such as Polish pierogies, local beer, the daily farmer’s market at Hala Mirowska, bountiful pork products and lush green spaces. It’s kind of ironic to go from pork-deprived Istanbul to pork heaven here in Warsaw. I no longer have to fill my suitcases with pork and “smuggle” it across country lines to our apartment. However, I’m sure I’ll be bringing pork to my friends in Istanbul when I return to visit later this summer. 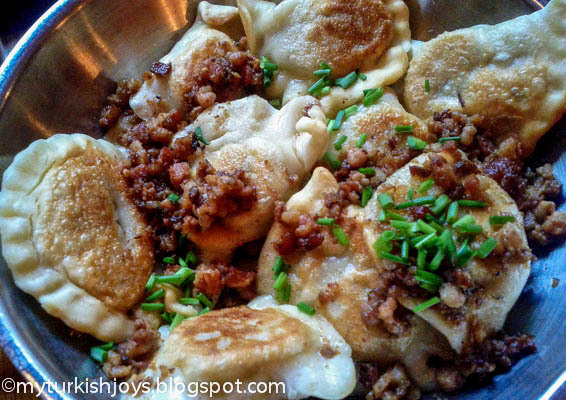 Polish must-eats - meat and cabbage filled pierogies topped with bacon"gravy" at Zapiecek Restaurant. 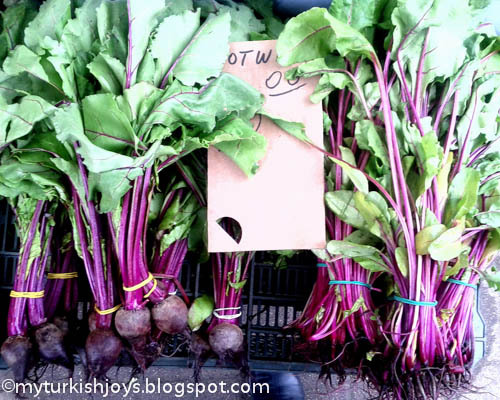 Beautiful baby beets found at Hala Mirowska in Warsaw. Upon first glance, Warsaw doesn’t reveal its beauty as openly as Istanbul does. The Vistula River appears quite gloomy and muddy compared to the glistening Bosphorus. 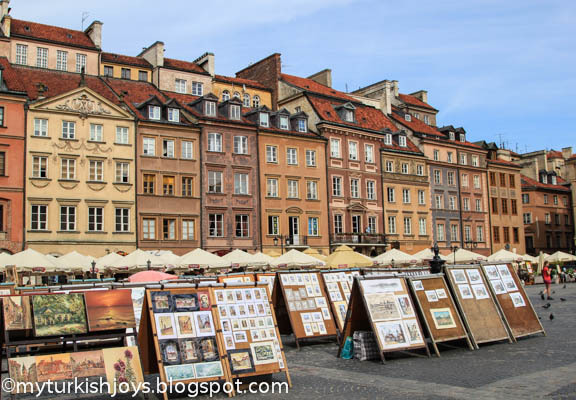 The red roofed buildings in the background signify Old Town in Warsaw. But as you walk through the Old Town area, you can’t help but marvel at the beautifully restored buildings and want to stop for a local beer and sit under an umbrella and people watch. Unfortunately, nearly 85 percent of Warsaw was leveled by the Nazis during World War II. The hard working Poles have spent many, many years trying to rebuild their city. I’ve got a lot of exploring to do here. Local artists set up in the large, open square in Old Town, Warsaw. A view of old and new Warsaw as seen from the viewing terrace at the Palace of Culture in Warsaw. I hope you’ll continue to follow my new expat adventures here in Poland. Don’t worry as I’ll still be sharing some of my Turkish stories, and who knows where my travels will take me in Eastern Europe. My Facebook Fan Page is still at My Turkish Joys because I haven’t figured out an easy way to change it without starting a whole new page. Any advice? Thanks to all my loyal readers for reading me every week! I truly appreciate all your comments, retweets, repins and likes. OMG - those pierogi look divine! Must have bacon cracklins on top. You will love eastern Europe - it's been my go-to place for over a decade (besides Turkey of course). Hope you get to explore the Czech and Slovak republics, Bulgaria, Romania and Ukraine, as well as the rest of the Balkans. 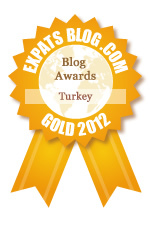 The people and food are wonderful and there is a lot of Turkish history as well. The best of both worlds, IMHO. Bon courage as we say in Provence! @Vixen, I'm sure the homemade ones from your mother are the best! @Julia, thanks dear! Making the changes have been a pain. And to think I just do the blog for fun! HA! I loved Poland and Warsaw was one of my favorite cities. Be sure to visit the salt mines not too far from there. They're really impressive. And I'm really happy you're continuing the blog! Very jealous of all your pork! Best of luck on the new adventures! i am so excited to follow you on all of your new discoveries! i spent so much time in the czech republic and praque is quite the happening city. pierogies are one of my most favorite things to eat. i live in pierogi heaven and can get about every kind imaginable. i make my own often. i am thrilled to get to see poland through your eyes! Happy you are settling into Poland....I'm jealous of all the pierogies you will be eating. My grandparents originally come from next door to Poland the Ukraine so I miss my Grandma's pierogi's. I'll be looking forward to your new changes and great name you chose.